The celebration of the historic Apollo-Soyuz 35th Anniversary of the project Test Project mission took place in OMEGA Flagship Boutique in Moscow on Wednesday July 21st 2010. 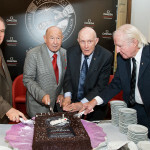 Legendary Soviet cosmonauts Valery Kubasov, Alexei Leonov, and U.S. astronauts Thomas Stafford and Vance Brand opened the unique exhibition of photographs, dedicated to Soyuz-Apollo project. 30 archived photographs reflected the history of this legendary mission have been sorted out to the exhibition by RIA NOVOSTI (Information Agency). During the opening ceremony the cosmonauts and the astronauts left their autographs on the photographs. Now the exhibition is opened for all the visitors from July 22d to 31st in GUM. 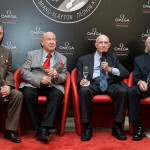 During the cocktail evening in OMEGA boutique the legendary cosmonauts were presented the limited edition of OMEGA Speedmaster Professional Apollo-Soyuz “35th Anniversary”. After the awarding ceremony the space heroes had a special surprise – a chocolate Torte with Apollo-Soyuz and OMEGA Speedmaster emblems. 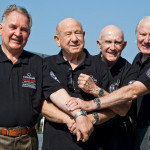 This entry was posted in Press Release and tagged Apollo-Soyuz on July 21, 2010 by Dale Vito.